We did this, literally, in 2010. It’s been two weeks since Brian and I got married, and a little over a week and a half since we returned to Virginia from where we got married in New York. We went back north to get married because we’re both from New York, much of our family is still there, and because, well, it’s legal in New York, and not in Virginia. Our return to Fredericksburg was the subject of some comment around the time of the wedding. A heckler during the toasts made a joke about the discrimination we would face upon returning home, and I also made a comment on Facebook about becoming legally unmarried when crossing the Potomac. Though such comments play well for laughs, but of course the reality is more complicated. To begin with, we are still married for most federal purposes (although with still significant holes, like Social Security Survivor Benefits), some of which are pretty important. 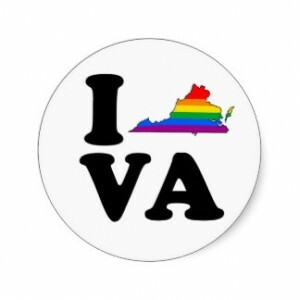 And recognition at the state level can’t be far off; the Fourth Circuit heard arguments about the constitutionality of Virginia’s gay marriage ban back in May, and a decision is apparently expected any time now. But more important is the social reality of our return to Virginia. Far from returning to some place of social ostracism, we were congratulated by probably a dozen people on the street in the first twenty-four hours of being home. (Someone should write a piece about the different lived reality of Facebook in small towns, where instant information sharing and frequent physical encounters can create an extremely intimate community. Maybe I’ll write that post sometime.) This included being congratulated by a family in a crosswalk in front of our car as we were exiting the interstate back into town, having congratulations shouted out the window of a moving car, and multiple encounters in coffee shops, restaurants, and bars. Our new neighbor threw an impromptu dinner party in celebration. In general, the support has bordered on embarrassing. This reception was in keeping with our general experience of Fredericksburg, where people have been incredible warm, open, and welcoming … or if they aren’t, they’ve been too polite to say so, and have done an incredibly good job of hiding it. New York still leads Fredericksburg in on-street heckles, 1 to 0. Clearly we are privileged Fredericksburgers, but as usual, our preconceived notions about gay life across America are generally a flattening of reality.